"The Last Word" host Larry O'Donnell condemned Bill O'Reilly on his Monday show calling him a "joke" he even said "The O'Reilly Factor's" host a serial liar. He said "dozens of guys I grew up with who were just like him. Overbearing, argumentative, Irish guys who think they know everything and can back up nothing. Those guys have always been a joke to me, which is why O'Reilly almost never has the capacity to outrage me, because he is just a joke to me most of the time." 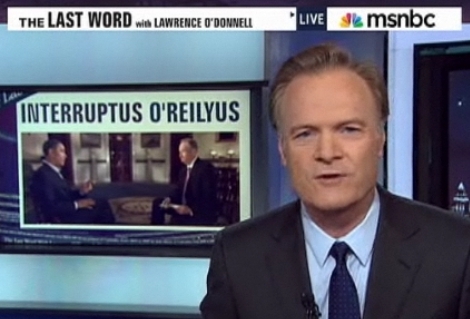 O'Donnell told his audience to not be fooled by O'Reilly's "faux-Irish tough guy style." His comments were prompted by O'Reilly saying that there were "strains of anti-Americanism" on MSNBC. O'Donnell used this comment as an example of O'Reilly's lies. O'Donnell said "He has by now figured out exactly what his audicnce wants to hear, and that's what he delivers," he said. "And when that requires lying, O'Reilly can do it without blinking because he's discovered that there's a lot of money to be made in those lies." He said he sees O'Reilly as "a very, very, very rich man who has grown phenomenally rich by playing a character on TV that the most gullible audience in the history of television falls for."